What, how, when and where can one learn outside the school? Together, students of the Uhland-Gymnasium and the Gemeinschaftsschule West explored potential learning environments outside the classroom. 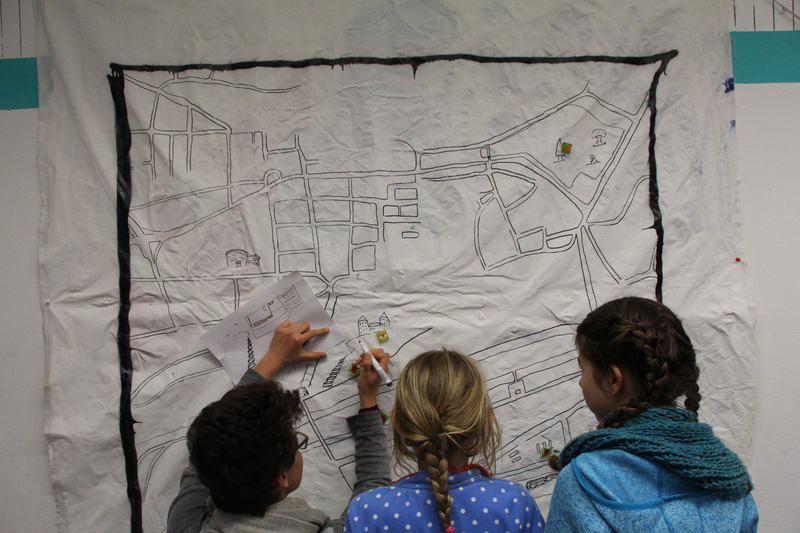 Occupying the public space along the geographical axis which connects the two schools, they transferred their experiences into cartographies and mindmaps. What can one learn from the landscape gardener, the mail delivery woman, or the retired neighbors? Starting from their considerations and practical experiences, together they designed and tested new learning concepts for a school without a school building. The Gemeinschaftsschule West – Tübingen is a three to four-form school with ca. 700 students. The Uhland-Gymnasium is Tübingen’s oldest school with a tradition in humanistic education. With the teacher Markus Riese. The kollektiv orangotango was formed in 2008 as an informal network of critical geographers. The focus of its activities is critical educational work, the creation of self-organized structures, and concrete social interventions which contribute to the reflection on and overcoming of existing circumstances In addition, orangotango aims to create spaces for the networking and exchange of ideas between social movements, emancipatory struggles, and alternative everyday practices.